Jacobowitz et al. identify two enzymes essential for anther development. Background: Just like all organisms, plants must reproduce for the continued survival of their species. Moreover, humans are directly dependent on plant reproduction for food, oil, fiber, and more. Most plants that we encounter in day-to-day life reproduce by making pollen. When pollen grains aren’t irritating our sinuses, they are serving as protective capsules that transport precious cargo. Inside the tough walls of pollen grains are the male gamete cells that will fertilize the female ovules. This process of fertilization produces the seed, and subsequently the next generation. Therefore, it’s critical that a plant succeed in producing pollen. Pollen production occurs in the anthers, which are structures that are typically seen on top of stems in the interiors of flowers. Although we know a lot about anthers, there are still many genes that are important for anther development that we don’t fully understand. Question: Here, we built upon previous works that compiled extensive datasets detailing gene expression in anthers. We focused on an important family of plant enzymes: Class III peroxidases. We sought to understand if any Class III peroxidases are important for anther and pollen development. If so, what do they do? Findings: We discovered two enzymes, PEROXIDASE9 and PEROXIDASE40, which are essential for anther development. When these genes are disrupted Arabidopsis thaliana cannot make pollen. Without these peroxidases, a special set of cells in the anther swells and the pollen grains degenerate. These swollen cells are known as tapetal cells and they form the walls of the chamber in which pollen develops. We demonstrate that these peroxidases likely reinforce tapetal cell walls by cross-linking structural extensin proteins. The lack of cross-linking results in a compromised cell wall, which cannot withstand turgor pressure, leading to swelling. Next steps: Arabidopsis has 73 different Class III peroxidases and 20 different extensin proteins. We only know the functions for a fraction of these genes. In this work, we uncovered a role for two peroxidases in the anther. 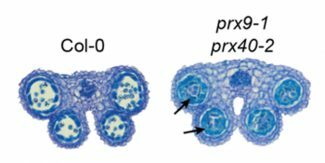 Future work will likely continue to dissect the different contributions that Class III peroxidases and extensins make towards plant development and fitness.